Cutch in resin form is what I use. A little goes a long way! Natural dyeing is an organic process that is for me 50% scientific formula and 50% practise/intuition given my disinclination towards fastidious note-taking. At some point, you just need to gauge from a practised knowledge of what shades the dye-pot will yield as test-dips of small fabric swatches will always differ from actually dyeing a whole batch of fabric. The second piece of fabric to be immersed into the dye pot may also yield a lighter shade than the first. Most dye formulas online only state the amount of dye to use proportinate to WOF (weight of fiber), but rarely the amount of water, which in itself determines the dye concentration. Ultimately, it is a lot of trial and errors. 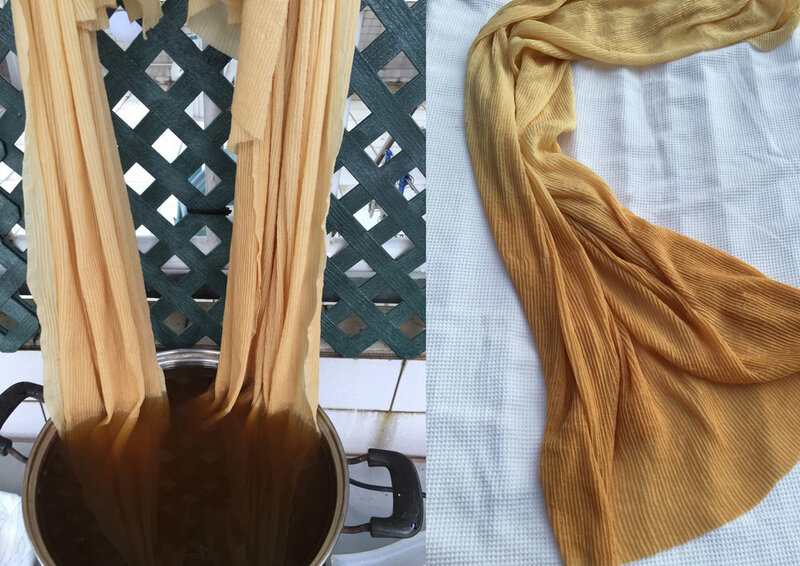 Cutch (or catechu) is a great natural dye for beginners to start with as it is so easy to use, and a little goes a long way! I usually weigh mine up in small sachets (that act as filters, to prevent stray bits from spotting an otherwise even dye) that I dissolve in boiling water before adding it to the dye pot. Sandalwood on the other hand yields a beautiful range of beige/orange hues, but is alot harder to use in the sense that the colour pigment isn’t easily extracted, and quite alot need to be used for mid-darker shades. Sandalwood powder dissolves in alcohol, not water! What I usually do is pack them again into little sachets that I immerse in a solution of alcohol (I use ethanol) and boiling water that somehow seems to aid the process. Silk eats up colour fast! For light shades, do not immerse in the dye pot for over 10-20 mins max. Can’t wait to update with pics of the finished INGRID dress!